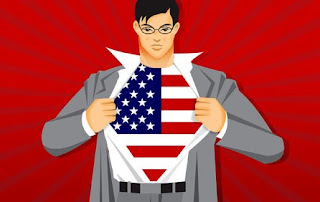 American Exceptionalism is self-indulgent arrogance in the guise of patriotism. It is also a pander much favored by politicians, especially those on the political right where "real" Americans live. Panderbear thinks America is exceptional in many respects and he is just as patriotic as the next bear, but going around telling ourselves and the world how much better the U.S. is than other nations is counterproductive. High national self-esteem is mostly a good thing, right up to where it leads to international boorishness and bullying. Being enamored of our exceptional military might and the exceptional righteousness of our cause led to foreign adventures in Iraq and Afghanistan that have cost us dearly in both lives and treasure. National hubris leads to a false sense of infallibility and the belief that other nations' experiences are irrelevant. Conservatives openly mock the idea that we may have something to learn from our European friends. Economic and social problems in the U.S. plague other nations as well. Ignoring their successes and failures in facing these same challenges is foolish. Exceptionalism blinds us to our faults and to potential remedies. If you cannot see a problem, you cannot solve it. If someone else has solved it, why reinvent the wheel? Even our best friends and allies have noted our tendency toward national arrogance. Winston Churchill said, "The Americans will do the right thing, after they have exhausted all the alternatives." Like Churchill, Panderbear thinks Exceptionalism impedes the pragmatism and open-mindedness essential to efficiently and effectively address our challenges. American Exceptionalism is insulting to friends and foes alike and is contrary to the egalitarian ideals that make America truly exceptional. From my early youth on I had the opportunity to travel to the States and learn much about it, not least due to relatives living in various locations throughout the U.S. In many respects I learnt to love the America I got to know and to wish that we in Europe might emulate its exceptional and fresh blend of pragmatism and principles. I have to admit, however, that I do not buy into the prose of "American Exceptionalism" and its concurrent narrative, particularly as, to me, it has been sidelined by right-wing politics and has usurped what used to be an exemplary patritiotism which, in parts of American society and media, has transformed into a bleak, monochromatic jingoism. The pragmatic American approach I learnt to appreciate in my youth would be to see what others do different and whether it can be accomodated to U.S. interests, to be open for theexperience of friends (and immigrants) alike and aim at the betterment of the all the people coming to and living in the U.S. I certainly hope that those days will come back, so that we in Europe learn from our friends in the States and they cherish, rather than derise our experiences as well. Thanks for your insightful and heartfelt comment. A dose of Franklin Roosevelt's new deal pragmatism is much needed.